Like most importers, you may be facing the challenge of balancing costs with product quality when manufacturing overseas. In particular, importers that are used to manufacturing domestically and are now trying to take the initiative to maintain their quality standards at factories in Asia may wonder about the best approach. 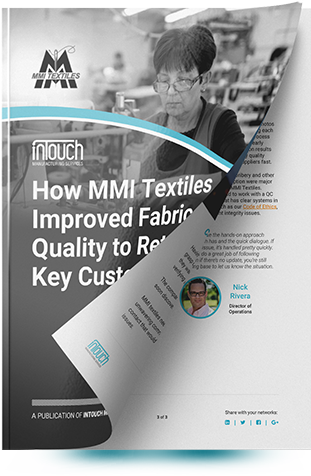 Download your FREE copy of InTouch’s case study: "How MMI Textiles Improved Fabric Quality To Retain Key Customers” and discover how a dependable QC partner helped MMI overcome this and other QC challenges when working with suppliers in Asia. 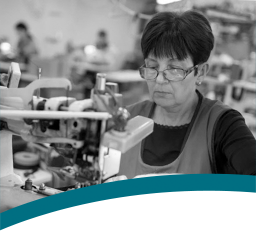 Managers at MMI wanted to take a "proactive" approach in maintaining their fabric quality. But upon beginning their search for a QC partner, they soon discovered how many companies offering QC services were unreliable. They needed the right third-party inspection firm to provide hands-on and personalized service. MMI sought a QC partner able to provide detailed reporting with clear photos and remarks documenting every step of the inspection process. This would help staff at MMI to understand the inspection process and address any issues discovered quickly. Swift response from a dedicated point of contact. MMI wanted personalized and reliable service from a single, dependable contact. They didn't want to have to coordinate inspections and understand results by talking to several different people offering different answers. Perhaps most importantly, MMI valued high integrity as a deciding factor in choosing a QC partner. Bribery and other forms of corruption were major concerns for the company. Clear and thorough reporting allowed MMI staff to understand issues discovered during inspection and react quickly, addressing any problems prior to shipping their products. As a result, the company has been able to retain key customers that had experienced frustrating quality problems with suppliers they'd worked with previously. Any importers working with suppliers in Asia will find that proactively monitoring quality can help them avoid problems that disappoint their customers. If you're ready to find out more about MMI’s story and what you can learn from their experience, just fill in the form on this page and click "DOWNLOAD NOW" to request your FREE case study direct to your email inbox!